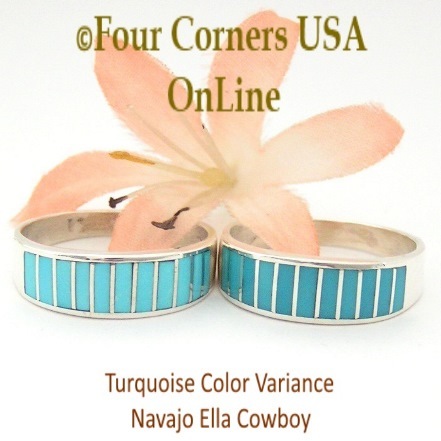 Turquoise White Fire Opal Inlay Wedding Band Rings and Bridal Engagement Ring Sets by Native American Navajo Inlay Artisan Ella Cowboy. Ms. Cowboy has a wonderful Contemporary styling exemplified by her precision channel inlay and each Bridal Engagement Ring is complimented by a round cubic zirconia in a quality six prong setting. These beautiful time honored Turquoise Opal Bridal Engagement Wedding Ring Sets and Bridegroom Turquoise Opal Inlay Band Rings are wonderful replacement Wedding Band Rings, Anniversary Gifts, Commitment Rings or just signs of affection. 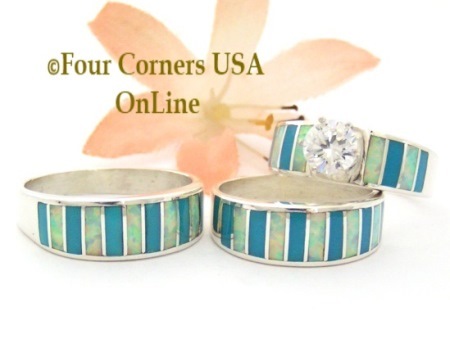 Native American Turquoise Opal Inlay Wedding Band Rings are a wonderful alternative to traditional or socially expectant Wedding Rings and a true expression of your personal style. This image of color variance is a fair example of the tone difference in the new Turquoise being used. Unfortunately, it does not (in my humble opinion) depict the true beauty of the deeper Turquoise which has that 'glowy' translucent color often seen in Sleeping Beauty. These Turquoise White Opal Wedding Rings also match our deep blue Turquoise Wedding Rings and Sets. Use our 'Compare' feature to see your ring selections side by side for easier viewing. Compare 3-4 choices by checking the 'compare' box and at the end click on 'Compare Selected' to view!